My name is Nick Whiting and I am based in the West Midlands, near Dudley. I have been playing these classic games ever since I was tall enough to see the playfield. Throughout my senior school years, I couldn't pass any location that had some. It was mostly the cafes and coffee bars that had them where I lived. 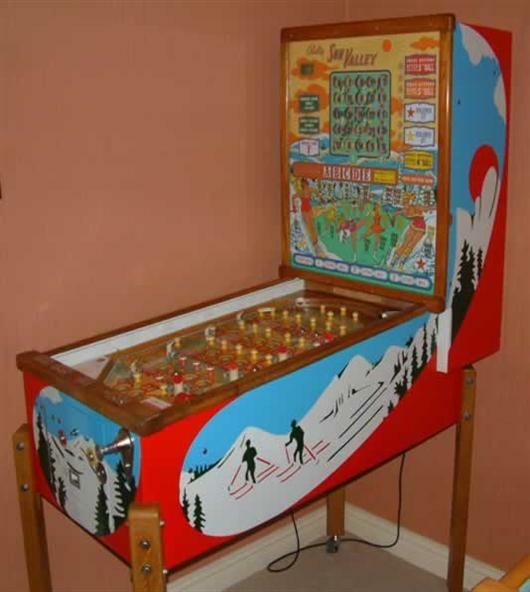 They always had a a few flipper games and a few bingo games. The flippers were for amusement only. The bingo games were supposed to be, but the cafe owners would pay people out 'under the counter'. School dinner times usually meant a trip to the cafe with a few mates, to play the pinballs. Being late back because we had replays to use up meant trouble, but it didn't stop us. We just loved playing them so much, and a payout for a big win on a bingo was always very welcome, although it didn't happen often. I never thought about owning a game then, I guess I did not think it was even possible. When I realised it was, well that's where my passion for collecting these games started. The first game I bought was a Bally Sea Island bingo, in the late 1970s. An owner was closing his cafe and he offered me the chance to buy it. I did, then spent many months making it work as it should. 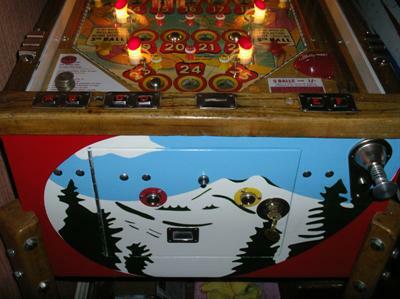 I restored the wood work, restored the artwork, and played it for years. Bingo games have no flippers, a player must develop and rely on good 'nudging' skills to land a ball in the desired hole. I have owned one or more games for the last forty plus years, buying them, making them work and making them look nice. The internet has taken it to another level, as good used, NOS and reproduction parts can be found, and much more information about them is available. That has made it possible to repair and restore a game to near new condition. I now buy, restore, collect, and play these old games as a serious hobby. Some I keep, some I sell on to buy more. Limited space means I can't keep them all. Every one is restored as a potential addition to my collection, and selling games I have restored is always hard . A flipper game will take anything between 50 and 120 hours to restore. The bingo games can take many weeks of work to make them beautiful again. Then all take many more hours, refining how they play, to get the very best from them. The Bally bingo games are very complicated due to the random nature of operation, and the fact that they have many circuits to control how the features, odds and extra balls are given during game cycling. Cycling is how you build up a game on a bingo. The first coin gives a basic game, inserting more is a gamble, it may give a feature or odds improvement or it may give nothing. The higher the odds or the more features won, the less chance of more being given. As one feature advances, it reduces the chance of others doing so. If the odds and features are advanced, it makes extra balls harder to get. They take much longer to restore. The cabinet art makes the creation of stencils intricate and time consuming, and the electro mechanical components and wiring are very complex. The Sun Valley below took over 3 months to restore. It is now a permanent part of my collection. 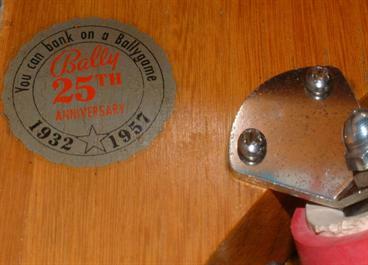 It was one of two games made in 1957, to celebrate the 25th anniversary of the Bally company. It still has the 25th anniversary label on the upper apron. See the link to Bally bingo games on the links page if you're interested in learning more about these highly complex EM gambling games. 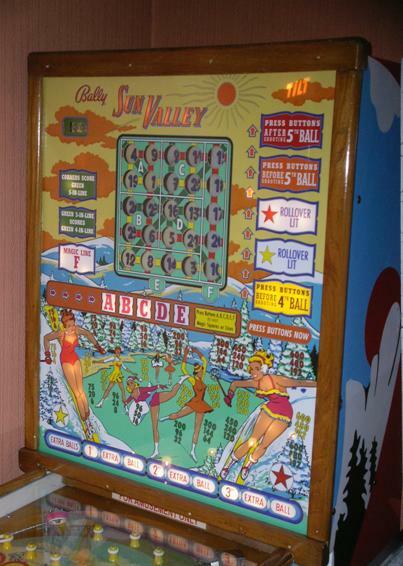 This is a Bally 'Sun Valley' bingo game, made in 1957. Total production of this game was only around 500 units. It is a magic squares and lines game. When A-B-C-D-E-F features are lit, every number on the screen can be moved. Depending on how the time tree is lit, the numbers can be moved before shooting the 4th or 5th ball, or after shooting the 5th ball. As scoring can only take place when the 4th ball has been shot, it is far better to be able to move the numbers when scoring can happen. That way, it's possible to move the numbers on the screen and score more than one line. The game can register up to 999 replays, it is possible to win 600 for one line. 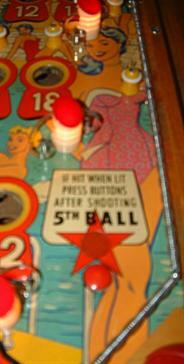 Up to three extra balls can be earned, by pressing the yellow button and either using up replays or inserting coins. The red button starts a new game and cycles it, if there are replays on the register. Otherwise, it needs more coins. 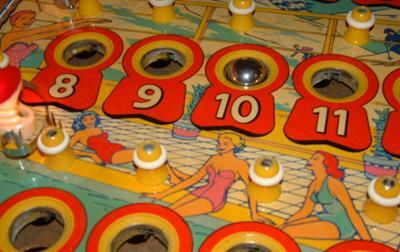 The object of the game is to light up the numbers on the screen by dropping balls in the holes on the playfield. Lit vertical, horizontal or diagonal lines of three, four or five score various numbers of replays. That depends what the 'odds' on the back glass are showing. There are three colours of lines and three vertical sets of numbers that represent them. Each has a number for 3, 4 or 5 in a line. The first coin gives the odds at the lowest setting, cycling the game can increase these odds up to higher figures so a winning line will give more replays. In the 1960s, it was common practice to get paid out by the cafe owners. They would pay the player the number of games he had won multiplied by whatever value coin the game used. This was illegal, but it was a very big incentive to play these gambling games. Bingo games could eat coins as fast as they could be put through the slot. It required a lot of nudging skill to win. I have seen grown men lose an entire weeks earnings in a couple of hours on a Friday evening. That was in the days when workers were paid cash in wage packets. I am always interested in buying an old flipper or bingo game. If you have one you would like to sell, let me know. Please bear in mind the cost of restoring a game when considering the value of a game you are thinking of selling. Although the cost of a restored game can be high, it has probably taken many man hours of work, and several hundred pounds in parts and re plating, to complete. Even after all that, it may only be worth a comparatively small amount. Only the very collectable games, fully restored, will command the high prices. The value of a game needing work will depend on condition and which game it is.